Work of the Poet: What does the sign say? Happy Weekend, & great SWF post. I have no idea but it's funny for sure. A great odd shot too. I've got no idea what it means, but sure it's weird. No walking allowed? Funny little sign! As to my header - we really had a good time when I took that picture (and a bunch more) from the observation level of the Statue of Liberty. We had 2 of our grandsons from SC along for a quick visit -took them over and under the Hudson, up, down and across Manhattan. Maybe next time we will cross the East river into your area. Maybe you are only allowed to fly ? Must be for Superman ! I think it means no footprints allowed. Lol funny sign. Sad, really, there are so few footprints left on earth. no boots with little x's on the sole allowed! Thanks guys you have me LOL! I think it says "do not wear shoes with treads." Weird one, Mary! Clearly -- see all the X's? -- this sign was put up by someone with a boot fetish and it is an offer to kiss your foot wear! 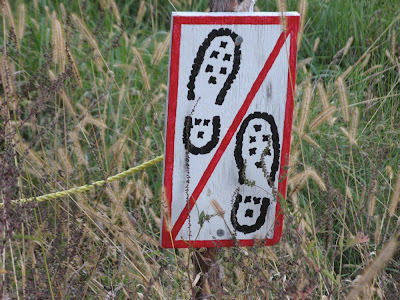 Well at the risk of spoiling the fun--that's a badly rendered "Don't walk on the grass" sign. Parks don't want you walkign off trail because it damages the land when a ton of people do it. And I know, you all probably knew that.